What can you identify here? Akai MPK49 – new kid on the block. Roland TR-808 – nothing quite matches the kick in the stomach you get from that kick drum. 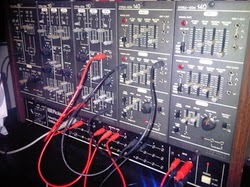 Allen & Heath, Brenell Ltd. System 8 – Model 168. 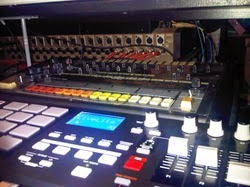 It has 16 inputs (Mic/Line), 8 outputs plus stereo mix and 8 track monitoring. It weighs in at a hefty 47kg. I don’t use this currently and it needs a bit of TLC (some meters stuck, back light bulbs failed and of course faders need a clean), but I may fix it up one day.